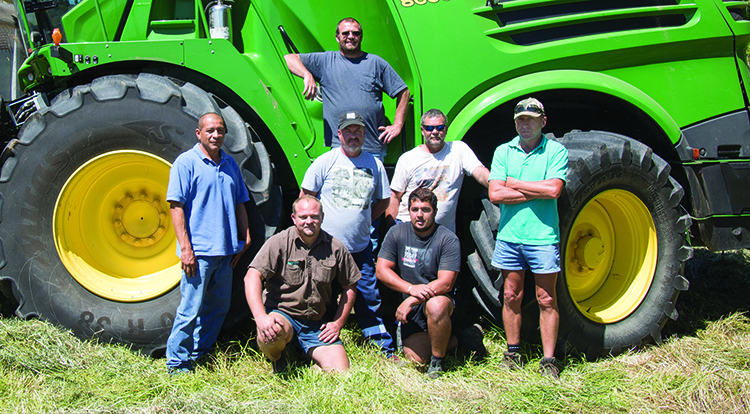 The Huffman Farms’ custom harvesting crew prepares to chop a field for a local dairy farm. Johan Brink (back row) manages the custom enterprise. South African H-2A employees are the backbone of the workforce. 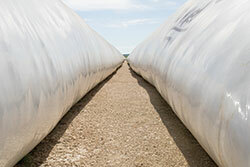 The crew also harvests 3,200 acres of home-grown corn silage that is stored in bags and in a large pile. Kevin Huffman is a survivor. Like most farmers and ranchers, he tries and he fails, then he tries again with a different plan of attack. Eventually, a winning combination is found but with the underlying notion that there’s always room for improvement. A big part of that new model involved harvesting corn for silage. Huffman, along with his wife, Sheryl, who manages the farm’s bookwork, still cash crops and plants 4,200 acres to corn, wheat, and cotton. Two of the family’s children also plan to return to the farm, which encompasses a 13-mile radius. He also has about 1,800 acres of pasture that supports 140 cow-calf pairs. The calves are sold after weaning. “We found it was easier to grow corn for silage than for grain,” Huffman explained. “We only average about 85 bushels per acre for our grain corn. It gets hot down here in the summer and the crop just starts to shut down at some point. We found that harvesting corn for silage provided a much more consistent product,” he added. Huffman started selling corn silage to dairy farms soon after taking ownership of the farm. At first, he hired a custom forage harvester out of Kansas to chop his corn, which was then trucked directly to his dairy farm customers. The homegrown corn silage enterprise has evolved since then. Huffman decided to build his own storage pad along with a drive-over scale. Corn silage is now delivered to his dairy customers as fermented feed that is stored in both bags and in a large drive-over pile. A Versa 12-foot bagger was purchased in 2011. “We like the bags in terms of the quality of the feed we can store, but the pile is a really cost-effective means of storage,” Huffman said. Silage is tested and delivered daily to their customers, many of whom are near Dublin, nearly 100 miles away. Huffman grows and harvests 3,200 acres of corn silage on the home farm. His average wet yield is about 12 tons per acre. “We get 30 inches of rain per year, but most of it comes in the fall and winter,” explained Huffman, who normally starts his planting season between February 15 and March 1. Corn silage harvest begins about June 25 and continues through July. The central Texas farmer plants 112 to 116 relative maturity corn. Most are grain-type hybrids that help to leave his options open for harvesting. Huffman noted that he tried brown midrib corn but was not satisfied with the lower yields. Huffman Farms’ soils cruise at about a 6.5 to 7.5 pH. Soil samples are taken annually from the same locations in each field. “We find phosphorus seems to be our most limiting nutrient,” Huffman noted. Enterprise diversity is a common theme that comes up when talking with Huffman, and in 2010 he decided to start harvesting forage for neighboring dairy and beef farms. That’s when Johan Brink came into the picture. Brink, originally from South Africa, had previously been an H-2A worker in the United States. He received his citizenship and was looking for a permanent job and location. Hearing that Huffman was starting a custom harvesting business, he called and convinced him that he’d need a full-time manager for the enterprise. That was the beginning of a relationship that still exists after nearly eight years. 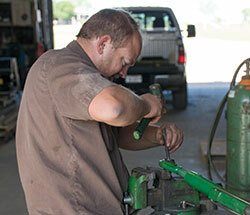 Brink coordinates the custom forage harvesting enterprise that also employs seven H-2A workers from South Africa. “One of our biggest challenges is labor and taking care of our employees,” said Huffman. “We’ve had very good success with our H-2A South African employees. Many of them come back every year,” he said of his seasonal workers. The current John Deere 8600 chopper is operated by Brink. There are also five trucks, a MacDon swather, and silage push tractor that are used when the job requires them. When Hay & Forage Grower visited the farm in late March, it was clear that Brink and his employees enjoyed and were passionate about their work. The job that day was on a dairy farm near Waco where a mixture of wheat and ryegrass were being chopped. The field was 17 miles from the dairy, which according to Brink was a pretty typical haul. For Huffman Farms, it’s not just about doing the job. “Customer relationships are really important for us,” Brink said. “We try to get to know our customers and their needs. We also try to educate them regarding new developments in silage making. We feel this helps separate our business from many others,” Brink explained. Whether chopping their own corn or forage crops for others, quality feed remains the end game. “We want our customers to be satisfied with both the quality of our work and the product we deliver,” Brink explained. For corn silage, he monitors kernel processing by floating a silage sample in water and checking the kernels for adequate processing. Part of the custom business success story can be linked to dependability. “Custom harvesting has taught us to be more flexible,” Huffman said. “In this line of work, you can plan out a strategy, but often plans change with the weather or a farm’s other obligations. We have to change with them to keep them as a customer,” he noted. The willingness to experiment, change, and add or subtract enterprises has been a major driver for achieving success at Huffman Farms. That will no doubt continue into the future. By the way, if you want some custom planting done, a silage bag filled, or if you’re in need of some bagged deer corn, they do that, too. This article appeared in the August/September 2017 issue of Hay & Forage Grower on pages 14 and 15.